Help your children usher in the spring season with a fun activity they can revisit all year long. 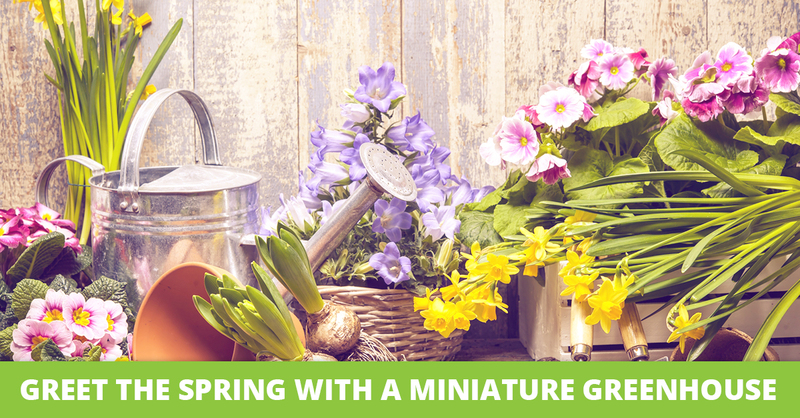 By building a miniature greenhouse, not only are you encouraging your homeschoolers to take on responsibility, but you're also introducing a potential hobby and showing them the miracles of God's world firsthand. Plus, you don't need a green thumb to do it, and your students will take great pride in checking their plants' progress over the upcoming months. Building a miniature greenhouse with your students should take about half an hour, and it can be accomplished with everyday household supplies. 1. Start by cutting the bottom half of a milk jug or bottom third of a 2-liter soda bottle so the top is open. The more malleable your container is, the more secure the pieces will fit back together. Without discarding the top half of the container, add a half a cup of sand, pebbles, or gravel to the bottom to promote drainage. 2. Next, fill the container with potting mix to just below the rim (about 1" from the top). To make sure your soil doesn't seep into your rock mix, you can precede the potting mix with a 1" layer of Spanish moss. 3. Now that the soil is in, it's time to sow the seeds. These can be herbs, household plants, flowers, or cuttings your children have collected. Scatter a few seeds on top of the soil and lightly press them. Next, add another layer of soil to cover the seeds. Then, lightly sprinkle or spray the soil with water. 4. Now, it's time to cover the greenhouse. Fit the top portion of your plastic container back over the bottom part. For the best fit, overlap the pieces by at least 2". Then, instruct each student to label his or her greenhouse and place it in a spot in the sun, such as a window ledge. That sounds like fun! I used to be in the greenhouse business and did everything commercially but as a homeschooler (and no longer in the greenhouse business), I keep clear plastic containers that food comes in at the grocery store (donuts, relish trays, etc.) that are deep enough to give the roots room to grow. It already has a lid attached that snaps in place and can easily be opened to water and clear to see the seeds germinate. Just wash the containers with soapy water and rinse well before planting in them.